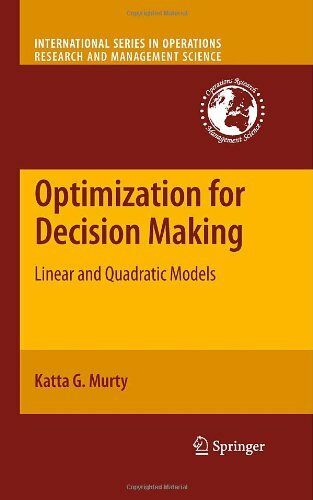 This is a Junior level book on some versatile optimization models for decision making in common use. The aim of this book is to develop skills in mathematical modeling, and in algorithms and computational methods to solve and analyze these models in undergraduate students. A comprehensive introduction to the subject for students and practitioners in engineering, computer science, mathematics, statistics, finance, etc. The book shows in detail how optimization problems can be solved numerically with great efficiency. The aim of this paper is to help practitioners to understand robust optimization and to successfully apply it in practice. We provide a brief introduction to robust optimization, and also describe important do's and don'ts for using it in practice. This book shows how to design approximation algorithms: efficient algorithms that find provably near-optimal solutions. It is organized around techniques for designing approximation algorithms, including greedy and local search algorithms. This book shows you how to model a wide array of problems. Covered are topics such as linear programming, duality theory, sensitivity analysis, network/dynamic programming, integer programming, non-linear programming, and my favorite, etc.